They came to praise Chuck Feeney yesterday in Dublin at Dublin Castle and it was about time. Nine universities, a former President of Ireland, Mary Robinson, and the current Prime Minister Enda Kenny gathered at the former seat of British power in Ireland to pay their respects. I was delighted to be there to witness the long overdue tribute to the man who may well be the most important Irish person of the last half century. He has singlehandedly boosted Irish education standards for generations with his phenomenal gift giving to Irish universities. But typically, the man himself has resisted all efforts to honor him, preferring the quiet places and lifestyle that have marked his career. Incredibly, yesterday was his first honorary degree. Yet in recent years he decided that his plan which he entitled "Giving while living" had to receive the oxygen of publicity and he had to step out and become a more public figure. One of his first events was at our magazine Irish America's Hall of Fame induction luncheon last year. Yesterday was another step in his creation of a public persona. His giving while living concept is simple. You can't take it with you and there are no pockets in a shroud. Bill Gates, Warren Buffet, and other billionaires have listened and met with Feeney and he has had a remarkable impact on them since he has gone public. Both men have agreed a similar type strategy when it comes to their billions. The world is a lot better place as a result. Feeney has given $1.6 billion to university institutions the length and breadth of Ireland, North and South, and allowed them to be competitive with universities everywhere. Generations of Irish students, trained to the hilt in research methods and new avenues of exploration and confident in their abilities, have gone forth and will continue to do so because of the incredible generosity of Feeney. Could there be anything more important for this next generation of Irish facing the challenges they have? Chuck Feeney has " transformed Ireland's higher education and research capacity and had used his wealth in the 'spirit of the true benefactor." Mary Robinson said. Prime Minister Kenny stated that Feeney was "an extraordinary man who has made an extraordinary contribution to Ireland." I am happy to have been part of his other great contribution to Ireland, the peace process. He was one of a small group of Irish Americans I put together who convinced Bill Clinton to become involved back when most people thought we were mad to even try. Feeney played a critical role in that American dimension too . For that and all the other good things he has done for Ireland, Feeney may well be the most important Irishman of the last half century. No one has left a more significant mark both in today's terms and for future generations. Which is why it was great to be there yesterday and see at last, a major acknowledgement of that. 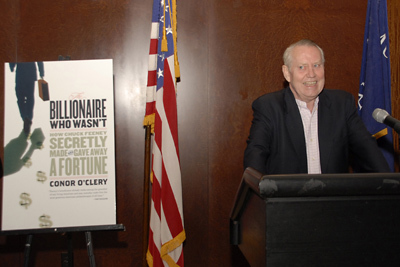 And Chuck Feeney wore a tie for the occasion, which he is loathe to do --- so it must have been very important to him!